Tasteful and heartwarming, Turmeric Tea Latte is like medicine in a cup. Turmeric is a spice that is often used in Asian dishes and belongs to the ginger family. It is also known as Indian saffron, jiang huang, haridra, and haldi. The primary active ingredient is curcumin. What’s so amazing about this underappreciated spice? Turmeric has been utilized in herbal remedies for a variety of ailments, including cancer, for many years. Early trials are starting to substantiate the reason for this, demonstrating promising results for preventing cancer in precancerous patients and helping kill cancer cells, especially in cases of breast cancer, bowel cancer, stomach cancer and skin cancer. In fact, research has shown that there are low rates of certain types of cancer in countries where curcumin is consumed at levels around 100 to 200 mg a day over long periods of time. Turmeric, along with ginger, both have anti-inflammatory and strong antioxidant properties. Ginger itself has been known to help treat ovarian cancer. Another important ingredient in this recipe is Dandelion root. It’s great for boosting the body’s immune system and helping the body to heal. It also helps combat heart disease, reduce the effects of aging, and has been show to cause cancer cells to destroy themselves. Raw honey has been used since ancient times both as a food and as a medicine. Raw honey contains natural vitamins, enzymes, powerful antioxidants, anti-bacterial properties, and other important natural nutrients. Drink up with this cancer-fighting tea latte! 1. Brew a large cup of roasted dandelion root tea. 2. Stir in turmeric, ginger, and black pepper, and let steep 8 to 10 minutes. 3. Lighten with some almond milk and stir in honey, if desired. 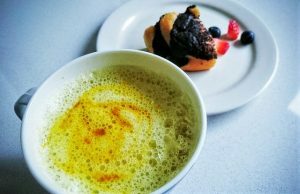 Enrich your summer nights with this flavorful Turmeric Tea Latte.